David Gilhooly, also known as David James Gilhooly III, is an American ceramicist and printmaker, born in Auburn, California in 1943. He graduated from the University of California, Davis with a BA in 1965 and an MA in 1967. 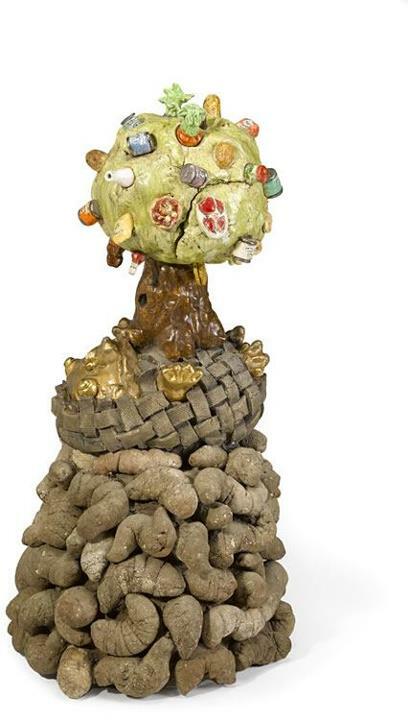 Gilhooly, together with Robert Arneson, Peter Vandenberge, Chris Unterseher and Margaret Dodd, working together in TB-9 (temporary building 9) were what was later to be called, The Funk Ceramic Movement of the San Francisco Bay Area. David left TB-9 for one semester to become Manuel Neri’s assistant and started making things out of lumber, fur, neon lights and asbestos shingles. In 1982, Gilhooly started exploring the media of Plexiglas, but still produced a multitude of ceramic pieces. The Contemporary Museum, Honolulu, the Fine Arts Museums of San Francisco (San Francisco, California), the Jane Voorhees Zimmerli Art Museum (Rutgers University, New Brunswick, New Jersey), the Little Rock Art Center (Little Rock, Arkansas), the Louisiana State University (Baton Rouge, Louisiana), the National Gallery of Canada (Ottawa, Canada), the Norton Museum of Art (West Palm Beach, Florida), the Oakland Museum of California (Oakland, California), the Palm Springs Desert Museum (Palm Springs, California), the Philadelphia Museum of Art (Philadelphia, Pennsylvania), the San Antonio Museum of Art (San Antonio, Texas), the San Francisco Museum of Modern Art (San Francisco, California), the San Jose Museum of Art (San Jose, California), Stanford University (Palo Alto, California), the Farhat Art Museum ( beirut, Lebanon ), the Stedelijk Museum (Amsterdam, Netherlands), the University of Arizona Art Collections (Tempe, Arizona), the University of California, Santa Barbara, the Vancouver Art Gallery (Vancouver, British Columbia, Canada) and the Whitney Museum of American Art (New York City) are among the public collections holding works by David Gilhooly.